Too few marketers truly use a data-driven content marketing strategy. Setting clear goals and using data as your guide ensures that you are developing the right type of content, getting it in front of the right audiences, and understanding its impact in a way that lets you continually optimize your strategy. I refer to this three-step framework as the three Cs: context, connections, and clarity – all of which are grounded in data. At the crux of data-informed design is a solid understanding of your target customers. The more you know about your audience, the better you will be able to develop relevant content that reaches and resonates with them at the moments that matter. This means gathering as much information as possible – including your customers’ online and offline behaviors – to determine their interests and how they act upon those interests. While it may not be feasible to develop true one-to-one content at scale, you can use this data to pinpoint common characteristics and habits of individual audience segments, and prioritize your content development accordingly. One of the most intriguing aspects of digital marketing is the data trail customers leave behind during their online journeys. Marketers are able to piece together this information in hopes of understanding the true context and intent of people’s interactions. These puzzle pieces come in many different shapes and sizes, including your customers’ search queries, social media conversations, digital media interactions, and more. Don’t undervalue the competitive intelligence at your fingertips. Invest time to understand what type of content your competitors are developing, and across what media. What areas are already saturated within the market? Are there certain keywords or topics that will give you top billing in search engine results? This will give you insight into whether you want to compete in those areas, or whether you can find some more open space to creatively stand out and win the heart of your customers. These are just a few ideas to get you thinking about creative ways to collect information, all with the goal of understanding the context of your target audience. As you continue to gather data, consider how your brand will use it to add value to the equation. An informed approach will allow you to create more relevant, timely, and differentiated content that will delight your customers. Your data is telling you an important story; make sure you’re listening. Through your data gathering, you should have a pretty solid understanding of what your target audience wants, when they want it, how they want it, and where they want it. Once you’ve developed content based on that understanding, the next phase is to distribute it in the most high-impact and efficient way possible. Just pushing the post button on your corporate blog isn’t going to cut it. No matter how relevant a piece of content is to your audience and how well you’ve matched it to their interests and needs, if they never see it you’re wasting your efforts. Now is the time to think through creative distribution methods outside of your owned channels. This may include leveraging advocates both inside and outside of your organization, or partnering with influencers whom your consumers trust. You can also use paid social or display ads to target the right kinds of customers based on the same contextual information you used to develop your content. Additionally, simple remarketing techniques can guide customers to relevant content at the time when they are most receptive. This final, data-driven step is an important one. Evaluating the success of your content’s performance not only informs the first two phases of your strategy, it also lets you prove the value of your investment. Study how to map your content to various stages in the customer journey. Traffic and shares are great places to start, but dig deeper. How are customers interacting with your information and how is it being used to advance or accelerate their next decisions? Through this analysis, you’ll identify key insights, such as whether your content is driving a shorter purchasing path or more frequent purchases. Consider setting benchmarks against certain segments and audience areas. For some brands, it can be difficult to assign ROI figures to content, in which case you might consider using proxy metrics to illustrate impact. I’ve seen marketers use different scoring systems to assign value to various areas of engagement and test pieces of content against each other. For example, a click on your brand’s content may be worth one point while further engagement with your site is two points, content sharing is three points, and a content download (such as a recipe or guide) is four. Then, assess the buying propensity of different score levels. This can be adjusted based on your goals and the types of content you are creating, but, ultimately, you are looking to show correlation between the scores and sales. The most successful content marketing campaigns don’t just happen by chance. Marketers have a wealth of data at their disposal. Knowing how to harness and leverage this information appropriately can be the difference between developing content that simply looks nice, and implementing a content marketing strategy that leads to engagement and conversions. 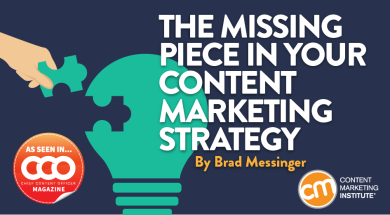 Content marketing has been said to be difficult, costly, and hard to measure. But do it right and there is an opportunity for outstanding payoff. Google Trends helps you identify trending topics and see the popularity of various search queries over time. Google AdWords Keyword Planner gives you insight into the searches your customers are performing, including linguistic opportunities you may not have otherwise uncovered. BuzzSumo enables you to research specific topics and see what articles about those topics have performed particularly well, giving you purview into how various pieces of your future content may perform. Pew Research Center and other data-rich research sites provide access to demographics, media analysis, statistics, and more. Your own first-party data, such as web analytics, can give you a wealth of insight into your audience and content performance. This article originally appeared in the October issue of Chief Content Officer. Sign up to receive your free subscription to CMI’s bimonthly, print magazine. Brad Messinger is the senior vice president of marketing for Rise Interactive, a digital marketing and analytics agency. Follow him on Twitter @BradMessinger.